Ever wondered how old your tires are? Looking to buy a used tire? Keep scrolling and you’ll find out what reading the tire DOT number can tell you. * By the way, D.O.T. stands for Department of Transportation. The first 4 characters of the tire DOT number are the plant code, followed by the size code. This comes in handy if there is ever a tire recall. Manufacturers can read the DOT code on a faulty product, using it to narrow down which plant may have made faulty products – and send that associated tire code information out to alert anyone who may have purchased a tire containing that DOT code. This is all made possible by registering your contact information and your tire DOT numbers with the specific manufacturers (tire dealers are now required to do this for all their customers – to keep everyone safe). The last 4 digits of the tire DOT number are the Week and Year of manufacture. It’s important to know the date of manufacture of your tires, especially if you are buying used tires. As tires pass the 24 month lifespan, they tend to lose essential oils through exposure to heat and sun. This loss of oil content leads to a decrease in the tire’s flexibility and elasticity. This can lead poor traction, crackling, or tearing in the side wall if not removed from service appropriately. So if you’re in the market for used tires, be sure to ask for the DOT number of each tire and check the last 4 digits to confirm if they are more than 24 months old. Used tires are definitely cheaper than the comparable new tire, but just keep in mind there may be an element of safety to consider before making your decision. 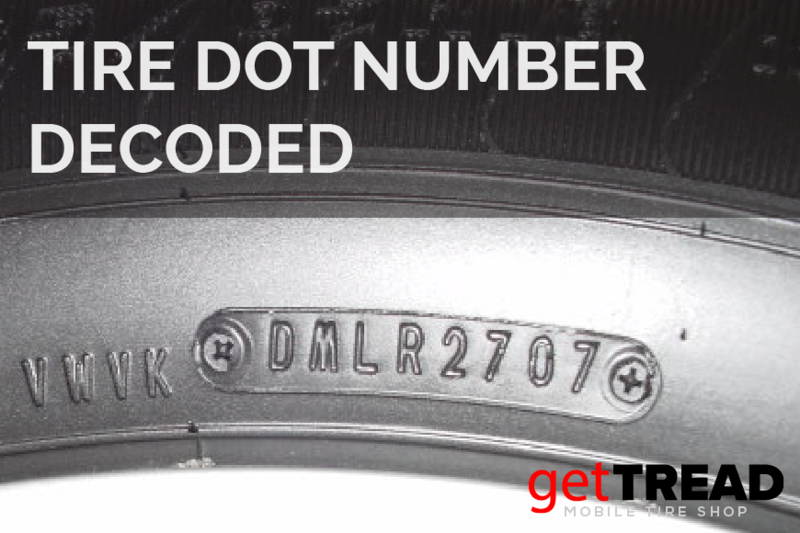 Well, now you know a little bit more about tire DOT number decoding. Rest assured if there ever is a recall on a set of tires bought from getTREAD, you will be notified immediately and the appropriate steps and credits will be applied to remedy the situation as quickly as possible. For more info on tire safety, hop over to our 3 Things To Know About Tire Puncture. And of course, if you’re in the market for new tires, check out the top brands and shop for tires based on your needs. Search by vehicle or license plate, filter by driving style. Book appointment online, and of course – WE COME TO INSTALL. getTREAD – Mobile Tire Service that fits YOUR lifestyle. I’ve been wanting to get some new tires for my truck, and I think some tips would be nice. I’m glad you talked about how you can ask for the DOT number of each tire. I’m going to have to look for some good tires and see what options would be best on my truck! That should help get your started.